Every year, IBPS will be recruiting candidates for Officer & Office Assistant vacancies in Regional Rural Banks in India. The area of operation of the RRBs is generally restricted to the geographical region of states or districts. Also, the range of activities handled by them apart from customer service and deposit mobilization is restricted to providing credit and other facilities to the small and marginal farmers, agricultural laborers, artisans and small entrepreneurs in rural areas. Making the farmers understand the benefits of the credit facilities in the most transparent ways. Spreading awareness about the different policies and schemes to local people. The work will be less when compared to other PSB’s. Since there is not much work pressure and it involves a lesser number of people, the work-life balance is better. For Office Scale 1- at 100% DA for new recruits: Rs. 28000-31000. The actual salary (take home) of the IBPS RRB Officer Scale-I will be around Rs. 30000. The probation period will be for two years’, and after successful completion of the probation period, he/she (Manager Trainee) will be promoted to Assistant Manager. Candidates recruited as IBPS RRB Officers under Specialist Cadre Post (Scale-II) can be appointed as Technology Officer, Chartered Accountant, Law Officer, Treasury Manager, Marketing Officer, and Agricultural Officer. For Office Scale-II – 100% DA for the new recruit will be Rs. 33000-39000 (approx.). The starting salary of the IBPS RRB Officer Scale-II will be around Rs. 39000. Like the Scale-I Officers, Scale II Officers will undergo two years’ probation period, and after successful completion of the probation period, he/she (Manager Trainee) will be promoted to the next level. Officer Scale-III is a Senior Manager post in RRBs. IBPS RRB Officer Scale I, II and III Post offers various perks and benefits and hence the demand for the post has been growing. Work pressure is lesser in comparison to commercial banks of the country. Employees can enjoy a good work-life balance under IBPS RRB Officers are eligible for 100% DA. The cost of living is usually lower as candidates are posted in rural areas. IBPS RRBs have a lot of growth potential as several government departments and government agencies liaison with the IBPS RRB and partner with them for work. Candidates must show their performance with what is allotted to them. So being part of a Regional Rural Bank at this stage would open various growth opportunities – both within and outside the organization. That is, a Scale I officer may become Scale II and III officers through various promotion. However, reaching the top position is decided by the government and not by individual banks. Since Regional Rural Banks are sponsored by commercial Public-Sector Banks, the head of RRB always gets nominated from the ranks of the sponsored bank i.e, mostly Assistant General Manager of the sponsored bank. Therefore, the most one can expect his career growth in Regional Rural Banks as an Officer Scale I officer is Chief Manager in a service span of 35 years which is very limiting. Want to Crack IBPS RRB PO Examination? 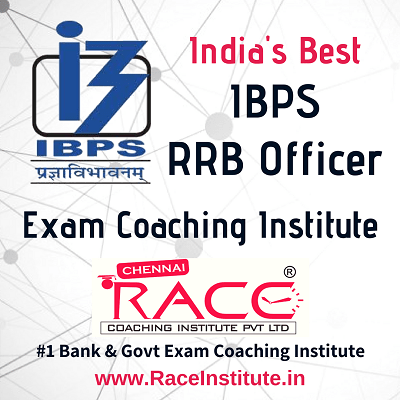 RACE Institute, a pioneer Institute for Bank & Govt Competitive Exams provides the best coaching for IBPS RRB (PO) Officer Examination in all the Branches of RACE Institute. Students joining in RACE to get Coaching for IBPS RRB Officer (IBPS RRB PO) Exam, could able to crack all the Bank Examinations conducted by IBPS, SBI, RBI, NABARD & Pvt Sector Banks, as well as the Insurance Examinations conducted by LIC, GIC, NICL, NIACL Insurance Companies etc. Because the Bank Competitive Exam covers almost 80% of the Insurance Exam Syllabus. So, any Banking aspirant could crack Insurance Exams easily with a little more effort. By keeping that in mind, we are offering Bank & Insurance Exam Coaching for just Rs. 13000/-. We strongly believe that our Coaching methodology, Facilities & Practice Programs in RACE Institute will surely make you crack these exams. Want to Crack IBPS RRB Officer (IBPS RRB PO) Examination? The Selection of IBPS RRB Officer (IBPS RRB PO) consists of Prelims, Mains, Document Verification & Interview Processes wherever applicable. The structure of the IBPS RRB Examinations which will be conducted online is provided as per the official notification. The corrected scores obtained by each of the candidates in different sessions (if held) will be normalized using the equipercentile method. Candidates must qualify by securing minimum sectional and overall cut-off marks. An adequate number of candidates in each category, depending upon requirements, will be shortlisted for Online Main Examination.